Jay’s Fabric Center will be a participant in the 2018 Row by Row Experience™ from June 21 to September 4, and teach quilters new skills. 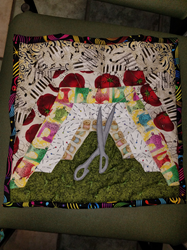 This is a nationwide summer event where quilters travel to different shops and collect these ‘rows’ to create a unique quilt. The theme changes every year, and each shop creates a pattern then gives it away for one row in a row quilt. Jay’s Fabric Center, a fabric and sewing supply store, will be participating for the fourth consecutive year in the Row by Row Experience™ from June 21 to September 4, 2018. During the event, quilters can visit any of the participating quilt shops and receive a pattern for one row in a row quilt, picking up from as many shops as they can, then mixing and matching rows to create a fun and unique quilt. Jay’s will be creating additional kits for purchase after the event. The first customer to sew together eight collected rows and follow the Row by Row quilting rules,will receive twenty-five fat quarters (6-1/4 yards of fabric), upon bringing finished quilt into participating shop. If they use Jay’s row and are the first person to bring their completed quilt into Jay’s Fabric Center they will also get a $25 gift card. Row by Row Experience™ began in 2011 with twenty quilt shops across New York State. Today, thousands of stores across the U.S., Canada and Europe welcome travelers through their doors. Jay’s Fabric Center is the leading source in the Tampa Bay area for all types of fabrics, sewing supplies, shop at home decorating service and more. Jay’s customers include seamstresses, recreational sewing enthusiasts, art & design schools, theater schools, and home decorators; it can also help anyone needing fabric or supplies for a special project. For more information, please call (727) 381-6600, or visit http://www.jaysfabriccenter.com. The store is located at 801 Pasadena Avenue South, St. Petersburg, FL 33707.